After our peaceful stay in Four Thousand Islands (minus the stomach aches), we had some time to kill before we were allowed back into Thailand. According to our Lonely Planet, the quiet, colonial town of Pakse seemed like the ideal place to hang out for a while before hopping over the border – how wrong we were. There are few places we really dislike, but from the moment our mini-van dispatched us into the dust and noise caused by machinery digging up the main road, we were already longing to leave. After being badly welcomed, in fact, pretty much ignored by the staff in our hotel and discovering that there’s only one half-decent place to eat in the town, we were already plotting our escape from Pakse. 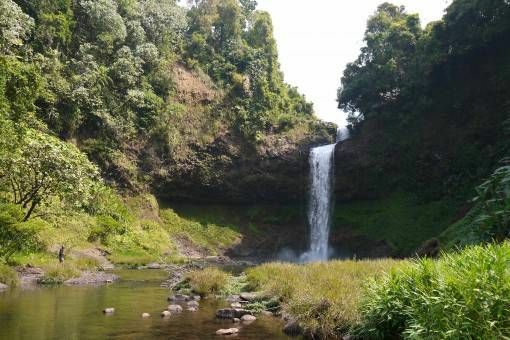 There are two reasons why tourists end up in Pakse; either they want to take the hour-long bus ride over the border to Thailand or they’re looking to explore the nearby Bolaven Plateau. By this point, having just spent a month in Cambodia and a week being sick on Four Thousand Islands, Andrew and I were desperate to get back to the relative comforts of Thailand. 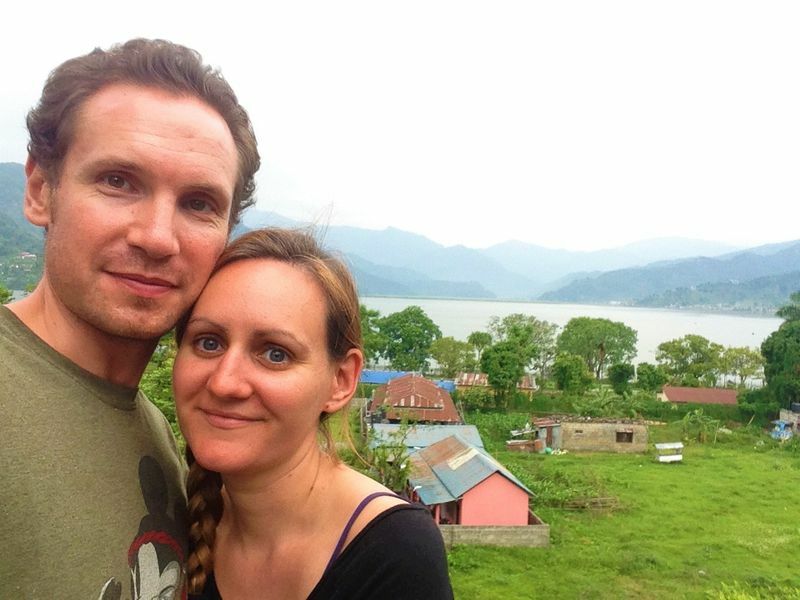 We wanted to spend a few weeks in familiar territory eating nice food and staying in comfortable places with decent wi-fi before we headed on to more adventurous plains in Burma. Our plans were scuppered though by ever-changing, confusing Thai visa rules. For the past few years it’s only been possible to get a 15-day stay when crossing into Thailand overland. In November however, we heard that the government had made changes, allowing citizens of G7 countries to stay for 30 days, which was just what we needed to see us through till our flight from Bangkok to Burma. To confuse matters though, we emailed the Thai embassy in London who told us this information was incorrect and we could only get a 15-day stay if we entered overland. 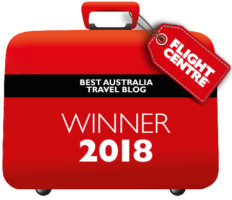 It turned out that they were absolutely wrong about this but at the time we were so confused we decided to play it safe and spend a bit more time in Laos – but what could we do in the meantime? 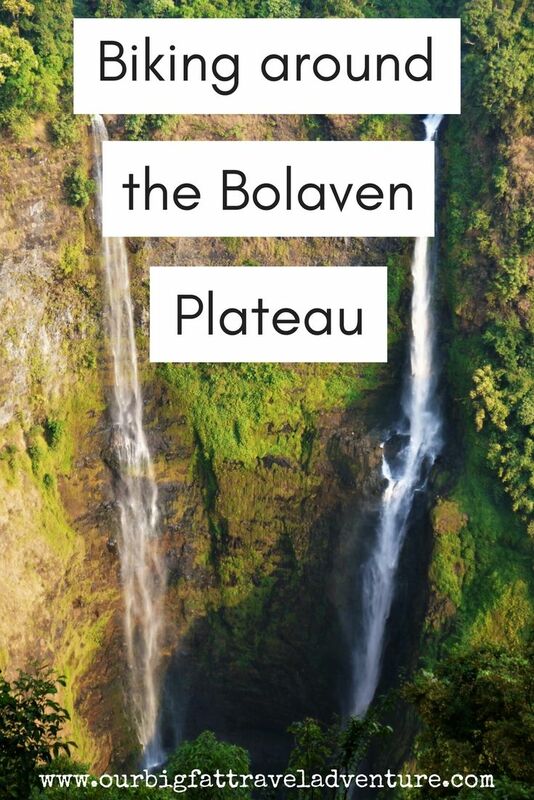 The Bolaven Plateau is a cool, mountainous green oasis located in the otherwise dusty heat of Southern Laos. 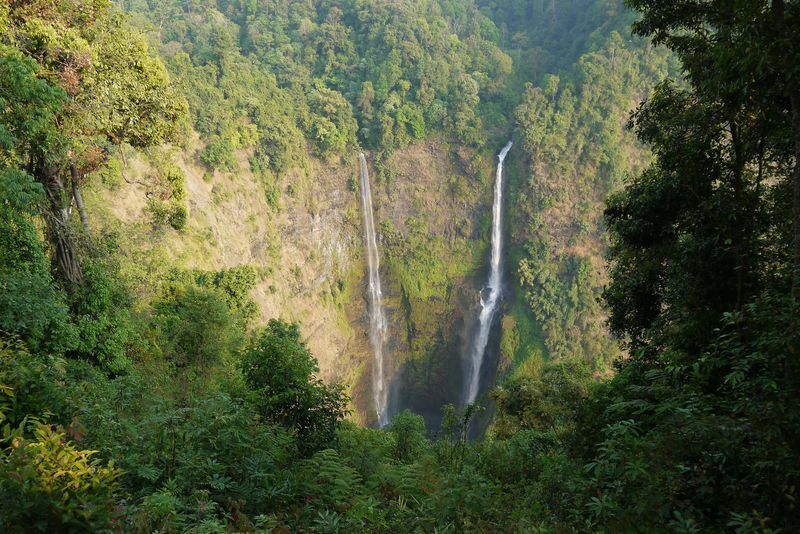 The area is peppered with numerous waterfalls, its fertile ground spurning hundreds of coffee and tea plantations. Perhaps betraying our true British natures, we tend to crave these kinds of places, preferring the cooler climes and lush green scenery to humidity and barren beaches. 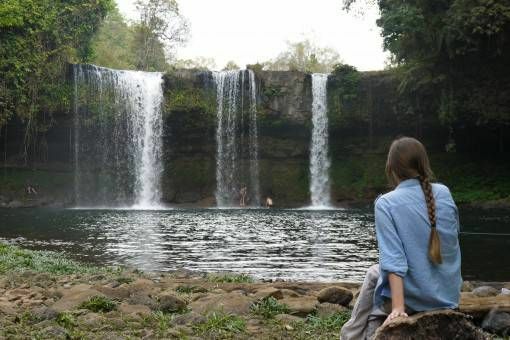 To prove this point, while in the Philippines we fell in love with the beautiful mountain retreat of Sagada, while we took refuge in the Dalat highlands in Vietnam and would choose forested northern Thailand over the beachy south any day – so we had a good feeling about visiting the Bolaven Plateau. After storing most of our stuff at the hotel in Pakse we headed off on a rental bike for an overnight trip to the Plateau. Immediately it felt good to be on the move, literally leaving Pakse in the dust as we sped off over bumpy roads towards distant green hills. Although the sun beat hotly down upon us, the air was cool and we drove uninterrupted for several hours before encountering the first of many waterfalls. Later that afternoon, all waterfalled-out and sore from hours of bike riding we reached the non-descript town of Paksong. Following a battered sign we found a quiet, if a bit bug-infested, hotel at the top of a hill where we set up camp for a chilly night. 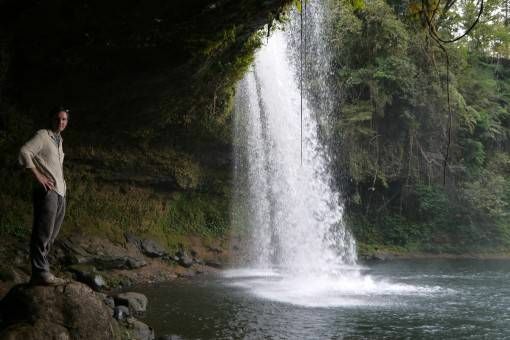 The next day was more of the same; bright sunshine, a cool breeze whipping the hair around our faces as we rode along in search of more waterfalls. Kids in crisp white school shirts waved to us we passed, their shouts of “Sabadyee!” muffled by the wind, while adults worked in the fields or spread coffee beans out on mats to dry in the sun. 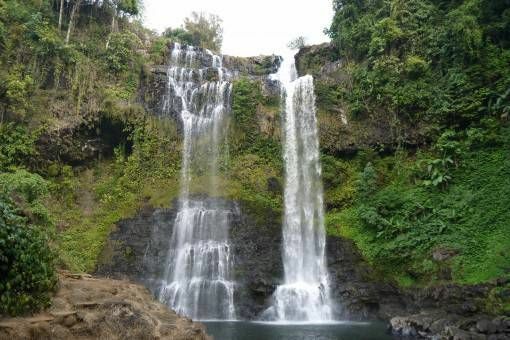 Finally we reached one of the most popular waterfalls in the Plateau, Tad Lo, which was surrounded by a nice village and a few guesthouses and homestays. Our final stop was the less impressive Pha Souam, which was crowded with tourists who had also come to visit a supposedly ‘real’ ethnic village – to us it looked like a fabricated tourist trap. By the time we arrived back in Pakse we were sore and exhausted, our faces red with a mixture of dust and sunburn – nevertheless our trip to the Bolaven Plateau made for a nice end to our final few days in Laos. Ah! 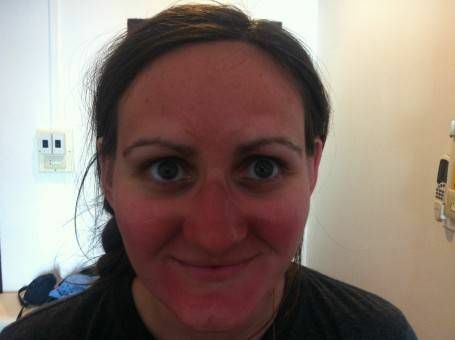 Love the last picture—we have more than a few of our own where Tony has a similar mask of dirt and sunburn! As we’ll be heading to Laos in just a few weeks, we’re trying to put together a rough idea of places to visit during our month there. All this talk of food poisoning and mangy hotel rooms is a bit offputting, but it sounds like at least in the south, it’s worth getting out of the cities and heading out into the countryside. 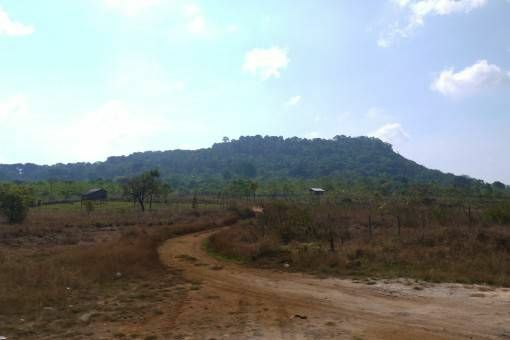 How did you find the roads around Pakse? It was on our tentative list of places to base ourselves for a few day as we toured around on a motorbike, but given the motorbike drama we had in Cambodia, I’m a little leery of riding my own bike if the roads are rough or traffic is bad. All that VISA confusion sounds confusing! Ha! Ha! The falls are so pretty, and I absolutely love the last photo of you! Ah the joys of travel! Isn’t it fun trying to figure out all the visa stuff? It looks like it turned out to be a fun adventure. Yep, visas are especially irritating here in Asia Kerri! Besides the fresh and cool waterfall, I also want to taste the cafe here since Bolaven Plateau is considered the golden land to grow this kind of tree. Anyways, thanks for the great post!